Most women (85 per cent) would back the idea of more frequent breast screening if they are at higher genetic risk of developing breast cancer, according to research* published today by The Breast. More than 940 women from across the UK were asked for their views on the possibility of tailoring breast screening to people’s genetic risk in a study funded by Cancer Research UK and The Eve Appeal. Two-thirds (66 per cent) supported the idea of adjusting the frequency of screening on the basis of risk. Dr Susanne Meisel, research psychologist at UCL (University College London), said: “Looking at whether genetic risk could be used to tailor and improve the breast screening programme is still at an early stage, but it’s useful to find out now what the public might think about this idea. Our study showed that, overall, women seem to support it. Jessica Kirby, senior health information manager at Cancer Research UK, said: “Breast screening saves lives, but it also has risks. One suggestion to try to maximise the benefit and reduce the risk is to tailor screening more effectively to people’s risk of breast cancer, but more research is needed to show whether this approach will be effective or possible. *Susanne F Meisel et al - ‘Adjusting the frequency of mammography screening on the basis of genetic risk: Attitudes among women in the UK’. The data are drawn from the health behaviour aspect of PROMISE 2016. Researchers are based at the Health Behaviour Research Centre, UCL; Department of Applied Health Research, UCL; and the Department of Women’s Cancer, UCL Elizabeth Garrett Anderson Institute for Women’s Health, UCL. It is possible that breast screening frequency could be varied depending on whether a woman is at higher or lower genetic risk of breast cancer. 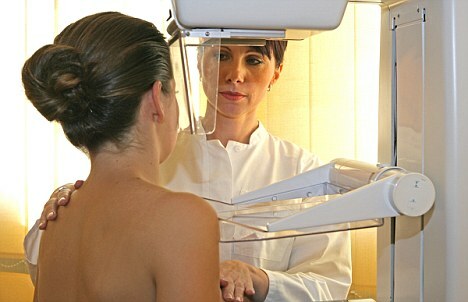 What do you think of the idea of varying the frequency of breast screening? Would you personally be happy to have your breast screening more often if you were found to be at higher genetic risk of breast cancer? Would you personally be happy to have your breast screening less often if you were found to be at lower genetic risk of breast cancer? Based on what you know, do you think genetic testing will do more good than harm, or more harm than good? Compared with other women of your age, what do you think are your chances of getting breast cancer? 65.8 per cent of the women supported the idea of varying screening frequency on the basis of genetic risk; 85.4 per cent were willing to have more frequent breast screening if they were found to be at higher risk; 58.8 per cent were willing to have less frequent screening if at lower risk. The work was undertaken within “PROMISE 2016” a 5 year research programme led by Principal Investigator Prof Ian Jacobs focused on developing novel risk prediction models for use in ovarian cancer screening. PROMISE takes a personalised screening approach by predicting a woman’s risk of ovarian cancer using clinical, epidemiological, proteomic and genetic data, and stratifying the subsequent information, support and risk management options depending on the woman’s level of risk. Genetic data will include testing the high penetrance genes associated with hereditary breast and ovarian cancer, BRCA1 and BRCA2, as well lower penetrance genes associated with ovarian cancer susceptibility. The work has the potential to streamline cancer screening and reduce overdiagnosis and overtreatment. The Eve Appeal is the only UK national charity raising awareness and funding research in the five gynaecological cancers - ovarian, womb, cervical, vaginal and vulval. It was set up to save women’s lives by funding groundbreaking research focused on developing effective methods of risk prediction, earlier detection and developing screening for these women-only cancers. The charity’s core research team, the Department of Women’s Cancer at University College London (UCL), and The Eve Appeal has played a crucial role in providing seed funding, core infrastructure funding and project funding to a broad range of it’s programmes, including PROMISE2016 which this research project fits within. Our vision is simple: A future where fewer women develop and more women survive gynaecological cancers.